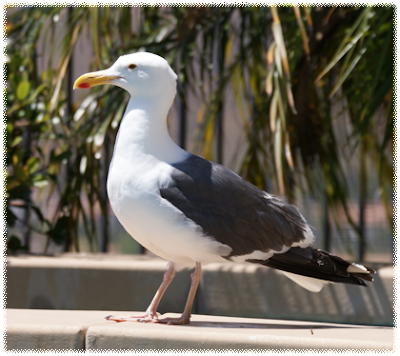 Yesterday we had a Seagull visiting our place. This is somewhat unusual, as we are about 10 miles away from the coast. Unfortunately, the bird did visibly limb: the right foot seemed somehow injured. The Seagull sat on the rim of the pool for more than an hour, when we started to worry. After confirmation with Wildlife experts we tried to capture it, and to my surprise, it would not fly away and we could make the catch. Then we got it to Project Wildlife, and hope for the best. It's the second time that the friendly people at Project Wildlife supported us.